This blog depicts how to configure the PGP Secure Store functionality in scenarios where the user doesn’t want to store the PGP keys (Private & Public) on a file system. Step 1: Go to the PGP Secure Store url (http://<host>:<port>/PGPSecureStore). Step 2: Select the file type to be uploaded. a). The file formats that can be uploaded are (*.asc, *.pub, *.sec). b). In case you want to upload .gpg extension format, zip the private and public keys as a single zip file and chose the “Select File Type” as Zip File (*.zip). Note: In case the file type is zip, the compressed zip should only contain the private and public keys. No other files/directories should be present in the zip archive. Step 3: Browse for the file and upload the content. You should see both the keys in the context area below once the upload is successful. The Secure Store configuration is complete with Step 3 above. 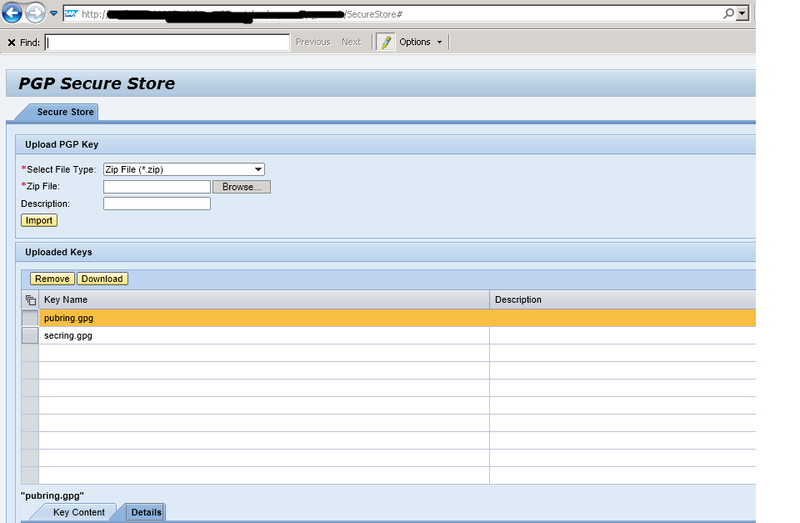 Next, move on the the communication channel to use the Secure store parameter. Step 4: Select the communication channel where the PGP encryption/decryption has to be implemented. Step 5: Go to the “Module” tab in the communication channel. Step 6: Configure the additional module localejbs/PGPEncryption or localejbs/PGPDecryption as “Local Enterprise Bean” as per the use case. Step 7: In the “Module Configuration” area, configure the parameter “useSecureStore” as “true“. Step 8: Save and activate the channel.